When I was walking through what should remain an unnamed large shopping centre in East London the other day, I was approached by a lovely lady selling lotions and cosmetics. She asked me if I wanted to try out their new hand lotion. She didn’t need to ask twice: long lab hours wearing different types of gloves don’t make for baby-soft skin. While going through her speech, the sales lady put particular emphasis on the fact that all her products were completely “chemical-free”. I was taken aback: what did that mean? Was she putting the complete and utter void on my hands in front of my very eyes? 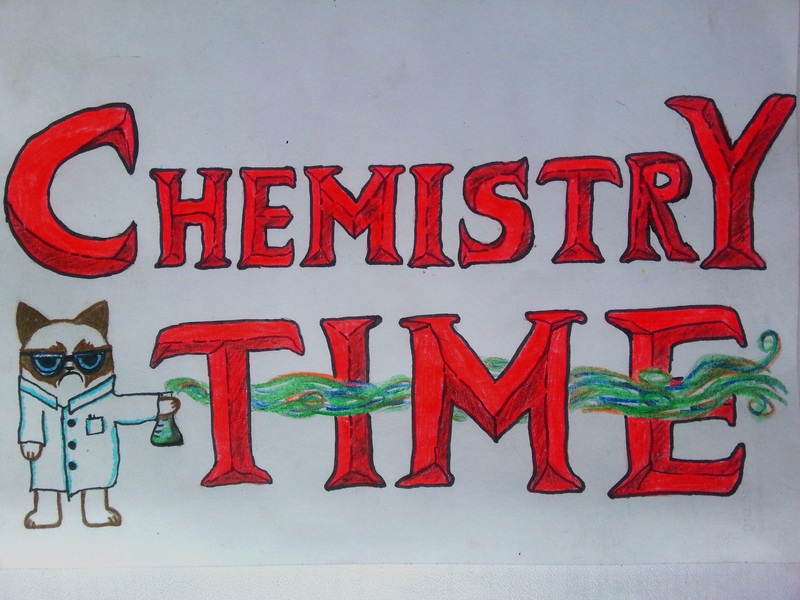 Because that was the only thing I could imagine in the world that wasn’t made of chemicals, i.e. atoms, molecules, matter of some sort. A few years back, the Royal Society of Chemistry (RSC) had offered a £1 million bounty for any product that the RSC could consider to be 100% chemical-free. I could almost picture myself receiving an oversized cheque, triumphantly raising my pot of hand lotion. But a quick glance at the ingredients of the hand lotion confirmed: full of chemicals. Water, fatty alcohols, glycerol, citric and lactic acids, glucose and a whole array of compounds like citronellol, geraniol and benzaldehyde that made it smell fantastically like rose petals. So why deny all those beautiful chemicals and claim it “chemical-free”? I diagnosed a case of chemophobia. Not necessarily the sales lady’s fault but probably a problem of many of her customers. What the heck is chemophobia? The IUPAC, the International Union for Pure and Applied Chemistry, defines chemophobia as “irrational fear of chemicals”. Why is it that “synthetic” chemicals get a bad rep while everything natural is the latest fashion? After all, there is a whole branch of chemistry, called total synthesis, entirely dedicated to making chemicals in the lab that are naturally produced by plants and animals. Usually this comes from the need to make large amounts of those chemicals that are difficult to get from biological sources. Take the perfume industry for example, which relies heavily on musk odours. Musks are chemicals produced in nature by a slightly creepy looking deer (it has tusks, like a sabre-toothed tiger). If the perfume industry would take all the musk they use from “natural” resources, there wouldn’t be any of those already endangered animals left in the world. Instead they use synthetic musks, made all cruelty-free in the lab. But where does chemophobia come from and why does it affect so many people? The chemical industry certainly had its fair share of disasters, one of the largest being the release of a toxic gas from a chemical plant in Bhopal, India, that killed thousands of people in 1984. Every industry, however, seem to have their tragedies. Looking at pictures of the collapse of a garment factory in Bangladesh last year is certainly as horrible. Maybe the rise of food additives gave chemophobia a push. While 100 years ago bread consisted only of flour and water, nowadays you can buy bread with a whole bunch of additives like preservatives, softening and flavouring agents. But then again, life in the 21st century is unthinkable without all those synthetic chemicals we’re so particularly fond of: from painkillers to plastics, from sunscreen to the liquid crystals in mobile phone screens. Some people argue that it is specifically the use of the word “chemical”. For most chemists, every substance in the universe, every piece of living organisms and the world around us is made of atoms and molecules which are nothing else but chemicals. For others, the world chemical means something that has been made in the lab and is potentially harmful, such as strong acids and chlorine gas. However, I think most people have experienced at some point in their lives the similarly harmful effects of the strong acid produced in the human stomach. All “natural”, this acid is really good for digesting food but really unpleasant in the upper regions of the throat. Regardless of the origin of chemophobia, concerns about harmful chemicals are not entirely irrational. Many shampoos contain formaldehyde, a potentially toxic chemical. But that is also the case with most living organisms. The amount in one shampoo bottle is so tiny that you would have to drink 14 of them (who the heck would do that anyway?) to get the same amount as you would get eating an apple. Rather than buying “chemical-free” cosmetics or food and rewarding companies who give all chemicals a bad connotation, we should ask manufacturers to clearly label their products and policymakers to implement strict laws that only allow the use of chemicals in amounts safe for humans. Let us know what chemicals are in our products, how much of it is in them and what they do. And most importantly we need to face our fears. Chemicals are amazing, they are the basis for life and technology; they can make bread rise in the oven, make a banana look and taste like banana, cure illnesses, digest food, and literally make us happy (one of the many effects of the brain chemical serotonin is to mediate happiness). And if in doubt, ask your friendly neighbourhood chemist. Like people, chemicals can be good and bad. There are those you can’t get enough of and those that are only tolerable in small doses. I wouldn’t think of all people as bad just because I’ve met a few really nasty ones and I wouldn’t do the same with chemicals. 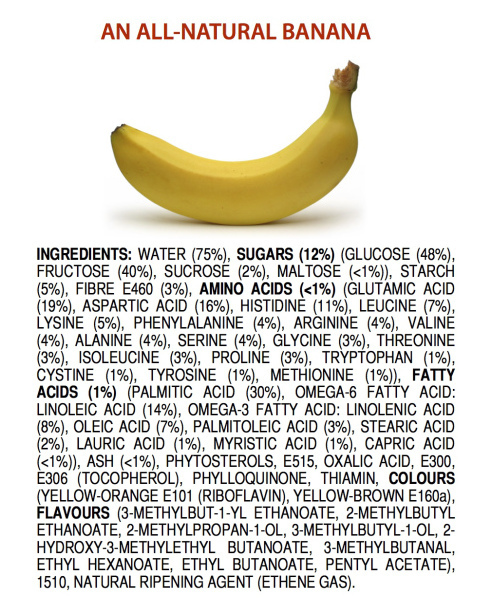 For more details on what chemicals are in an all-natural banana or which chemicals make herbs and spices smell so good? Find out here and here. Please read this great recent post by Mark at the Chemistry Blog (includes beautiful new graphics by Compound Chem!). Download a copy of a serious guide on “Chemical Stories” from the awesome guys at Sense about Science! More about chemicals, the origins of chemophobia and what we can do to face our fears: here, here, here and here. This was originally published at Shot of Science. Thank you! I love educational posts! It was fun reading this.And Thank you for sharing such as interesting fact. hehe, I have thought many times about this. I always get a mixture between laughter and annoyance when I watch a soda or food commercial that says its products are only made with natural sweeteners. Well, where does sugar come from??? Last time I checked it was a plant. And I believe, it was a natural one. I would point to the dumbing down of the populace regarding science generally. To demonize CO2–a crucial component of the life cycle–but ignore the buildup of man-made plastic breakdown products (for instance) in the environment, seems the utmost in hypocrisy, especially since single-use packaging is so wasteful and unnecessary. My strategy for healthy eating in today’s context is to avoid packaging as much as possible, thereby getting more food value for the money, with a minimum of preservatives, artificial coloring and other superfluous chemicals. The “natural” or “organic” label is political and only serves to raise the price. Very true… new to blogging… one of the first interesting reads I’ve read! Very nice post. Want to improve my post. Any suggestions? Yes, yes, YES! This is one of my pet peeves too! EVERYTHING HAS CHEMICALS IN IT PEOPLE!!!!! Instead of looking for ‘chemical free’, take the time to learn what the different chemicals and ingredients are. Then choose things with safe, healthy ingredients, instead of long lists of things you can’t pronounce, and probably shouldn’t be slathering all over your body (or putting into your mouth to send to your stomach!). And I spent 30 years in the herbicide business. These chemicals, used per label instructions, help us feed the world. More and more noise out there about Roundup being a bogeyman. Less toxic than aspirin, it is. There are chemical producing plants, and then there are plants that produce chemicals…. Oh. They say women use 100 products a day that contain all sorts of chemicals, and I think it is so true that one of the biggest issues is that for people who aren’t chemists, we don’t understand what is going on, or into our bodies. I recently was talking with my yoga teacher, and she uses essential oils to cure most of her illnesses and suggested I try it. As I started to try and remove “harmful” chemcials from my life, it seemed impossible and I lost focus for why I was doing it. I think it is nearly impossible to live a completely chemical-free life even if you have all the time and money. I’ve decided that on this topic, just like most things, it is about balance, and trying to understand what you’re doing to your body, but also allowing yourself to live freely. I quit using underarm deodorant. Now I smell like the Bophal chemical spill. Do you think it’s okay to smear propolene glycol, sodium stearate, sodium chloride, stearyl alcohol and FD&C blue no.1 under my arms? I don’t have many friends left. I am very interested in the chemicals found in processed food. I read a story some time back that there are about 20 chemicals in a packet of food. These days I try hard to eliminate food in packets. Seems to be an easy rule to follow. I wonder if you could write abut the chemicals in processed food. Thanks for the informative article. HAHA! So enjoyed reading your post. Secreted some endorphins. Never though of it like this! Such a pleasant and instructive read! Thank you!